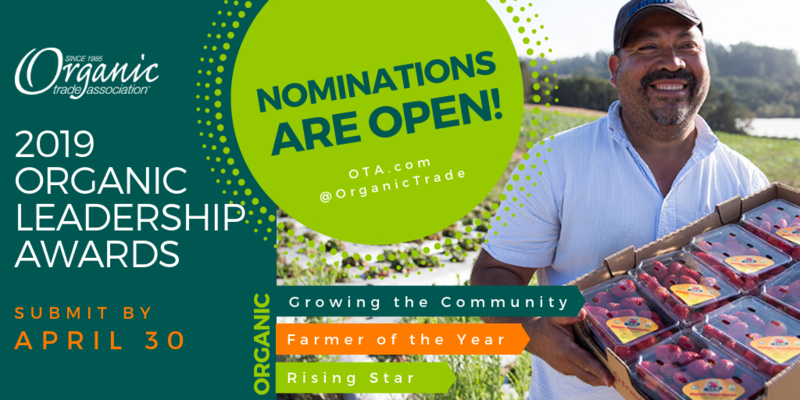 The Organic Trade Association's Annual Organic Leadership Awards recognize individuals who have shown leadership and vision in furthering the goals of the organic movement. The awards are presented at our Annual Awards Celebration as the kick off to Natural Products Expo East. Nominees are “game-changers” who have made significant contributions to growing the organic industry through leadership and action in areas such as consumer education and marketing, new market development, public relations, standards development, advocacy, and research. Nominees are professional farmers* who have made significant contributions to support and advance organic agriculture and trade at the farm level, such as increasing the amount of land under organic management, expanding the number of farmers using organic practices, or advancing organic agriculture through farm policy advocacy, community education, or innovative land stewardship and technical practices. Nominees are emerging leaders who have distinguished themselves professionally for their pursuit, zeal or notable advancements to programs, initiatives, new categories, or product development that promotes the growth, sustainability, or influence of organic agriculture and trade.